The sleek new Multi Function Automatic Blood Pressure Monitor combines valuable features with a contemporary new table top design. 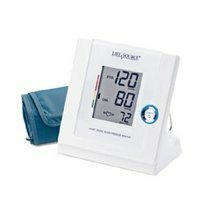 This monitor includes features such as: Pressure Rating Indicator - providing a snapshot of the user's blood pressure classification according to the US JNC7 guidelines. Irregular Heartbeat Detection - will alert the user to the presence of an irregular heartbeat while still providing an accurate reading. 90 memory - records the last 90 readings. Bilingual instruction guide with illustrations and quick start guide. Four week blood pressure logbook included.